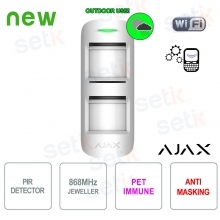 Don’t you have enough good reasons to try our brand new products by Ajax System? Here you are one more! By purchasing one product by Ajax System you will get the free shipment for your order! Do you want to know something more on this new excellent brand? Born in 2011, Ajax produces alarm and fire systems with JEWELER radio protocol, a wireless technology that allows to connect with a few taps the detectors in the mobile app. Click here to find out all products by Ajax System! How to get the FREE SHIPMENT? The promotion may not be combined with other ongoing promotions.